‘Selfplex’ is the term used by Susan Blackmore (1999) to depict ‘self’ effectively as the key confluence of schemas – ‘the ultimate memeplex‘ – which provides the concept of ‘I’, the cognitive awareness of who I am, how I think, what I feel, what I believe…why I am the way I am. Someone’s sense of identity or identities. The term ‘ego’ is widely used in Psychology and the other behavioural sciences as a cipher for ‘self’. It has even entered mainstream popular language in usages such as: “That’s egocentric” or “He’s got a lot of ego”. The very diversity of usages makes it too vague to use as a term for ‘self-concept’ – though it is often used in that context – which is why ‘selfplex’ is preferable. Sigmund Freud (1923b) used ‘Ego’ in a very specific yet cohesive sense. It is a force which attempts to balance the motivations of the Id and the Superego where they compete for dominance and restrains the more socially-unacceptable demands of the Id. This latter function can be seen in the way the PURPLE vMEME submits to the family or group to gain acceptance. Yet Freud also perceived the Ego as an ‘organisation’ of ideas – not least in how I must be in order to be accepted. How I am or how I must be are, of course, schemas which can be said to be core elements in the selfplex. Interestingly, Herb Fingarette (1963) states that the ego doesn’t strive to make meaning as if it is an actor carrying out an action; ego is the striving for meaning. Thus, Freud’s Ego force wanting to be accepted can be ascribed to the PURPLE vMEME while the Ego as an organisation of ideas is better thought of as the selfplex. A significant number of modern developmental psychologists accept that we are not born with a unitary self-concept as such. Rather there is a potential for it which is developed – shaped and reshaped over and over again. This is through direct teaching about ‘you’ – eg: “you are a clever girl”, “you are a bad boy”, etc – combined with reflection and trying to make sense – meta state – from experience and observation (incoming memes). 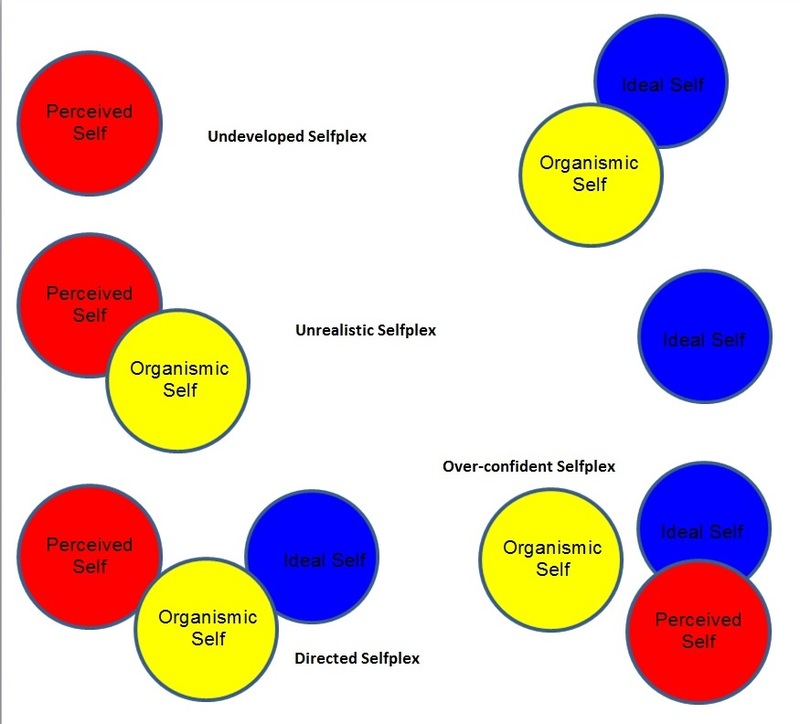 Blackmore’s selfplex construct is prefigured in many ways by Mihaly Csikszentmihalyi’s (1993) work on the evolution of self-reflective consciousness and fits with George Herbert Mead’s (1913) argument that the self is a ‘social product’ and Harry Stack Sullivan’s (1953) contention that a person is constituted of and by their interpersonal relations. The implication of this is that there is no intrinsic self – or, at least, no hard evidence for it! – beyond a set of innate temperamental dispositions – as described in Hans J Eysenck’s (Eysenck, 1967; Hans J Eysenck & Sybil B G Eysenck, 1976) Dimensions model – which can be found more or less in all the higher mammals. Everything else that might be described as part of self is learned or developed in some way. Certainly, as a determined atheist, this would appear to be Blackmore’s position. However, I personally see nothing in the selfplex concept which precludes there being some kind of ‘spiritual self’ as our ‘core being’. There simply is no evidence for it (yet) which is scientifically credible. Discussion of the possibility of there being a spiritual self raises the old mind/body Dualism debate which has bedevilled philosophers since the times of Plato and Aristotle and which hasn’t really moved on that significantly since the works of René Descartes in the 17th Century. Children who have a fairly positive set of schemas about themselves are likely to have high self-esteem and consequently are likely to be high in self-efficacy. Those who have negative schemas are likely to struggle more in coping with the ups and downs of life. The general concensus is that, in most psychologically-healthy children, the sense of self – the selfplex – is fairly well-developed by 6-8 years. However, with upto 8 vMEMES influencing the selfplex – as illustrated in the graphic left – and all the memes we are exposed to, it’s clearly not as simple as: once the selfplex is formed, that’s it – it stays the same for the rest of the individual’s life. As people shift from context to context, the Nominal Level selfplex is adjusted to the context – the neurological level of Environment. This may require shift in the vMEME stack. Where the neurological level of Identity is matched to the life conditions in the Environment, that shift (assimilation) is usually fairly smooth. Where what’s happening in any one context is out of kilter with the sense of identity in the selfplex, then a more complex shift can take place – with the struggle of accommodation of the incoming memes leading to quite dramatic shifts in the vMEME stack (the Deeper Level). Either way, the composition of the selfplex effectively blends, twists and morphs to assimilate and accommodate such changes. A more fragile selfplex may not cope so well with such changes. Depending on which vMEMES are dominating, what existing schemas we have and what memes we are exposed to, how we see ourselves – our selfplex – may vary quite considerably. It’s useful here to borrow Carl Rogers’ (1961) ideas of self from his Person-Centred Approach. There is something of Freud’s Ego Ideal element of the Superego in Rogers’ ideal self – and it is reasonable to assume that BLUE, whether alone or in a harmonic with another vMEME (eg: GREEN), is always a strong influence upon the formation of the ideal self. Interestingly, Rogers assigns a kind of Ego-type role to the integrating self in its efforts to bring about congruence between the perceived, ideal and organismic selves. How well congruence can be achieved will depend on a number of factors, including the initial health and robustness of the selfplex and the health of the vMEMES influencing it. Rogers sees the kind of love given to the young child as being critical to the development of congruent ‘selves’. Young children given unconditional positive regard (unconditional love) will feel loved for who they are, thus facilitating PURPLE’s need for acceptance and providing a sound basis for vMEMETIC development. Children given conditional positive regard (conditional love) are likely only to feel loved when they have achieved/met expectations, setting up an unhealthy red/BLUE vMEME harmonic. This will drive the individual to seek and meet others’ expectations – an external Locus of Control. Unconditional’ and ‘conditional’ in this context should be seen as opposite poles on a continuum rather than a rigid either/or and the level/type of regard given is reflective of the caregiver sensitivity displayed. Rogers’ concepts, which have an enviable record in applications such as counselling, enable us to look at the health of the selfplex and think about the effects of vMEMES upon it. The graphic above gives some indications of these kinds of effects. For example, in the ‘undeveloped selfplex’, the organismic self is close to the ideal self but the perceived self is a long way from either. This person sees themself as failing miserably against their idea of what they should be. Their concept of what they should be will most likely be coloured by BLUE, ORANGE and/or GREEN. Clearly incongruent, they may see themselves as self-indulgent and ‘sinful’ (dominated by RED) or unadventurous and overly security-oriented (led by PURPLE). The thing this person has going for them is the fact that the organismic self is close to the ideal self – therefore, there is potential to live close to the ideal. The way to help them is to get them to recognise and fulfil their potential. Unlike the ‘unrealistic self’ where there is similar distance between the ideal and perceived selves but the organismic self is much closer to the perceived self. With such a lack of current potential, the ideal self is completely unattainable. Using the concepts discussed in The Process of Change, such a person may be ‘arrested’, in which case it may be possible to facilitate change through the acquisition of new potentials. However, if they are truly ‘closed’, then it is better to persuade such a person to scale back the ideal self and work towards accepting themselves more as they are. Otherwise they will be frustrated and vulnerable to any number of psychiatric disorders. An interesting variation, using Rogers’ concepts – but someone most unlikely ever to knock on the door of a Rogerian counsellor – is the ‘overconfident selfplex’. Perhaps RED, in its puffed-up arrogance, has perceived itself as an ORANGE achiever more than capable of matching its ideals. But, in fact, the organismic self doesn’t have the potential to do this. So this person will appear to be ‘all talk, no walk’ – and I’m sure we’ve all met some of those in our time! 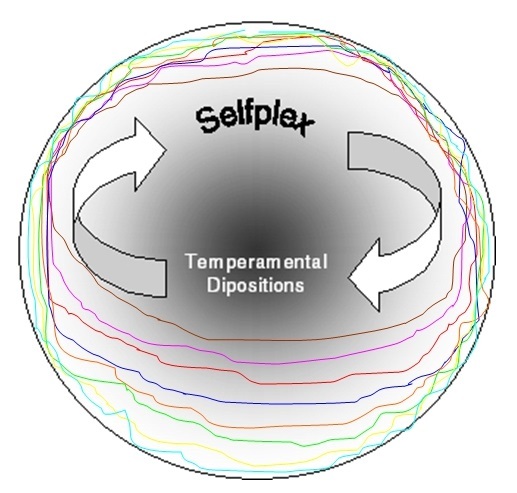 Perhaps the most potentially congruent is the ‘directed selfplex’. Here the the ideal self is just marginally beyond the organismic self which is just marginally beyond the ideal self. This person will be aware that they are not quite where they feel they should be but they have untapped potential and what they want to be is achievable. Much more research is needed on this but it may well be that, when the ‘directed selfplex’ has attained complete congruence between the ideal, perceived and organismic selves, then this is Self-Actualisation in the way Kurt Goldstein (1934) used the term – in that context the person has become all that they can be. 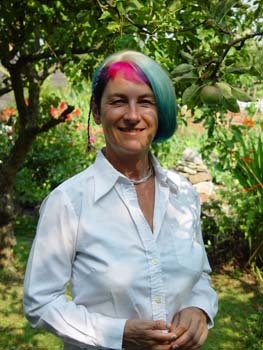 In terms of what Chris Cowan & Natasha Todorovic (2005) say Clare W Graves told them about an element of Self-Actualisation taking place at the peak of each vMEME, it would seem that complete congruence produces Self-Actualisation for that vMEME, thus providing the energy for the next hierarchical vMEME to start to emerge. Of course, 2nd Tier thinking is substantially different qualitatively to 1st Tier thinking and we’re only just beginning to fathom it out even slightly. However, since both Graves and, treating Self-Actualisation as a way of thinking, Abraham Maslow (1956), saw the 7th level (G-T/YELLOW, Self-Actualisation) as being free of 1st Tier delusions, then it will almost certainly be that thinking about self in the 2nd Tier is balanced in the way of the ‘directed selfplex’. Research should eventually confirm this. Erving Goffman (1959) and Robert Dilts (1990) have shown how, according to context, our identities shift – the ‘mask’ we wear for the social role the context requires from us. For most mentally healthy people, this shifting is relatively normal and takes place with only marginal recognisance of the tensions inherent in playing out sometimes quite different identities. (Eg: the doting father who is over-protective of his daughter from the attentions of other men – yet who is salacious towards other women when out in a group of men.) But what about when the selfplex is not strong enough to cope with playing multiple parts? According to Ralph Allison & Ted Schwartz (1980) – Allison being arguably the world’s leading researcher into Multiple Personality Disorder (MPD) – the sense of self should largely be formed by the age of 7. Those who suffer trauma – such as sexual abuse or being caught up in a war zone – before the selfplex is robust enough are at risk of developing full-blown MPD and experiencing different ‘personalities’ (‘alters’) taking them over during periods of their later life. Those who suffer such trauma after a strong selfplex has formed are at risk of developing the lesser form of Dissociative Identity Disorder (DID) in which they cannot accept certain thoughts and behaviours in certain contexts as being theirs – but they do not go so far as to attribute them to alters. An explanation for MPD may well be that, if the unitary self-concept is not strong enough, then the vMEMES influencing the selfplex, each pursuing its own needs and wants, may well appear to their owner to be acting as if they are different unique personalities. If the selfplex actually fractures, all it may need then, following the principles of Stanley Schachter & Jerome Singer’s (1963) Cognitive Labelling Theory, is for each vMEME’s ‘personality’ to be given a name – eg: ‘Joe’, ‘Jessica’, etc – and imagination may indeed start to attribute personality characteristics to the vMEME’s way of thinking. Thus, the alters of MPD may be rooted in vMEMES pursuing their wants and needs but given names – and the schemas and behaviour associated with the vMEME incorrectly labelled as being those of the name given to the vMEME. Those who have developed a strong selfplex are likely to cope much better with different vMEMES directing different thoughts and behaviours in different contexts because they have a much more settled sense of self. In spite of – and perhaps partly because of – the explosion of MPD cases in the past 50-60 years, DID and MPD are extremely controversial diagnoses in the worlds of Psychiatry and Psychology. A substantial number of ‘experts’ claim MPD cannot possibly exist and put diagnoses of it down to iatrogenic causes – eg: therapists putting ideas about alters into the minds of gullible clients. However, it it does exist, then strong vMEMES in a weak or even fractured selfplex may well be the root of it. In addition to DID/MPD, there are a number of other mental health issues linked to conflict in the selfplex between vMEMES. Freud linked such conditions as Obsessive-Compulsive Disorder and Manic-Depression Bipolar Disorder) to conflicts between different parts of the mind – and he had only identified 3, compared to the Gravesian 8! What Freud termed ego defence mechanisms are non-conscious strategies – selfplex defence mechanisms – employed to reduce the effects of vMEME conflict on the selfplex. However, the defence mechanism of isolation has a dissociation effect which would lend some support to the notion that different vMEMES can be perceived as producing thoughts and desires unacceptable to the selfplex as a whole, resulting in extremes as DID and possibly even MPD. Clearly vMEMES impact upon the selfplex, influencing the formation, development and sometimes decline of the schemas from which it is formed. The stronger the selfplex is, the more able you will be to balance out the sometimes conflicting needs and wants of your vMEMES.